Takeaway: Mesothelioma has no known cure, but there are treatment options and safe procedures to avoid asbestos exposure. Mesothelioma is a rare type of cancer linked to asbestos exposure. An estimated 3,000 mesothelioma cases are diagnosed in the U.S annually, most of which are linked to job-related asbestos exposure (find out what are the Top At-risk Occupations for Asbestos Exposure). Mesothelioma develops on the thin, protective tissue that covers important organs in the human body, known as the mesothelium. Pleural mesothelioma, which develops on the lungs lining, is the most common. However, mesothelioma develops on the lining of the heart and abdomen as well. Although asbestos use has been banned and its use reduced over recent years, the number of mesothelioma diagnoses is increasing. This is due to the fact that mesothelioma only develops symptoms 20 to 50 years after exposure. But this shouldn't encourage us to be complacent. Exposure remains a real possibility (we will discuss asbestos safety later in the article). Mesothelioma is a terminal cancer with no known cure. Nevertheless, researchers are making significant progress in understanding the disease and developing more treatment options as well as alternative therapies. A patient’s life expectancy depends on several factors, one being the stage at which the disease is diagnosed. Unfortunately, mesothelioma is usually diagnosed in its late stages so this makes the prognosis after treatment very difficult to predict. As you can see from the statistics and the graph below, life expectancy varies according to how far the condition has progressed. 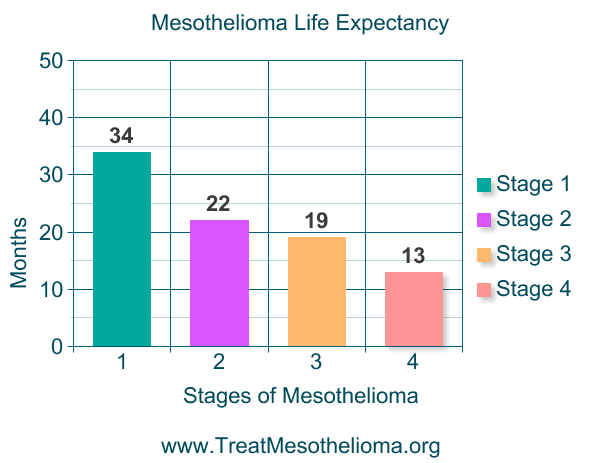 Please note that this is general mesothelioma prognosis data. There is no data for specific situations and scenarios. The leading mesothelioma treatment options include chemotherapy, surgery, and radiation therapy. Multimodal therapy, which combines some of these treatment options, is the preferred approach and it has proven effective in improving survival rates through clinical trials. Palliative treatments are also used to ease the symptoms of patients at all stages of mesothelioma. Experimental therapies, such as immunotherapy, have also been known to enhance the treatment progress. 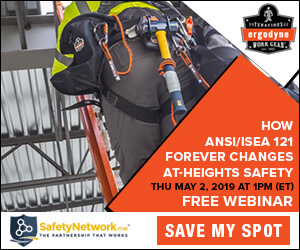 Since mesothelioma arises from exposure to asbestos, safe asbestos handling is crucial to not contracting the disease. In ideal conditions, this toxic mineral does not pose a health hazard. However, damaged or worn out asbestos products are a serious safety and health risk because its fibers become airborne once they flake off. Anybody in the vicinity of these airborne fibers can inhale them and they eventually become embedded in their mesothelium, which, later on, leads to the development into mesothelioma. Although the use of asbestos has been banned, some older homes still have asbestos flooring, insulation, siding, shingles, and ceiling tiles. These items must be handled with care during demolition or renovation (for more, see Asbestos: In the Home and Workplace). Homeowners can also eliminate their risk of exposure entirely by having asbestos containing materials removed professionally by licensed asbestos removal or abatement professionals. If you suspect the presence of asbestos in your home, you need to hire a certified professional to inspect; identify; and, if necessary, remove it. Conduct a careful, thorough inspection and risk assessment. Come up with a method statement to ensure that asbestos exposure risk is minimized. Create awareness among those who will work on asbestos containing materials and members of the family. Segregate the area where asbestos containing material is located in your home. Remove and dispose of asbestos containing materials professionally and safely. Asbestos removal or abatement professionals know when and how to remove or encapsulate asbestos. They also know how to properly dispose of the material after removal. So, before you decide either to remove the material or leave it as is, get a professional opinion. Mesothelioma Treatment Community is dedicated to the assistance and guidance of asbestos and mesothelioma victims around the world. As the largest resource for mesothelioma treatment options and complementary therapies for cancer, we are designed to help guide patients and their loved ones toward the answers and support they need to improve their quality of life, prognosis, and life expectancy.